Hello there! I am thrilled to announce Part Two of the seven part series on the history of the American quilt brought to us by Molly Williams. Over the next seven weeks Molly will explore the people, politics, patterns and processes that informed the development of the American quilt. She will take us from early African-American quilts to the 21st Century Art quilts that we see today. 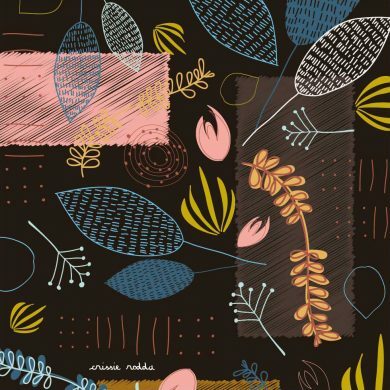 I find the history of textiles inspiring and fascinating and I hope you enjoy this series. It is widely thought that the American tradition of patchwork began with the early settlers utilising every scrap of imported fabric to make warm quilts for the homestead. However research suggests that expensive, imported English whole cloth quilts were found in early colonial homes. 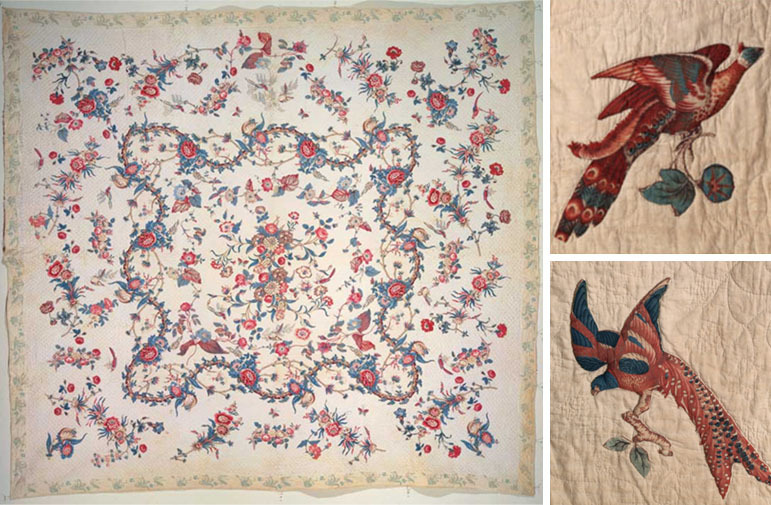 The making of American whole-cloth quilts did not become established until the 1750’s and it was not until after the The Revolutionary War, when America was freed from trade restrictions imposed by the English, that quilting evolved with a unique American style – bolder colors and innovative designs. A whole cloth quilt is not made from a single piece of fabric, as the name suggests; it simply means that the quilt is made from fabric of a single color or intricately embroidered to produce a highly textured, tactile design. 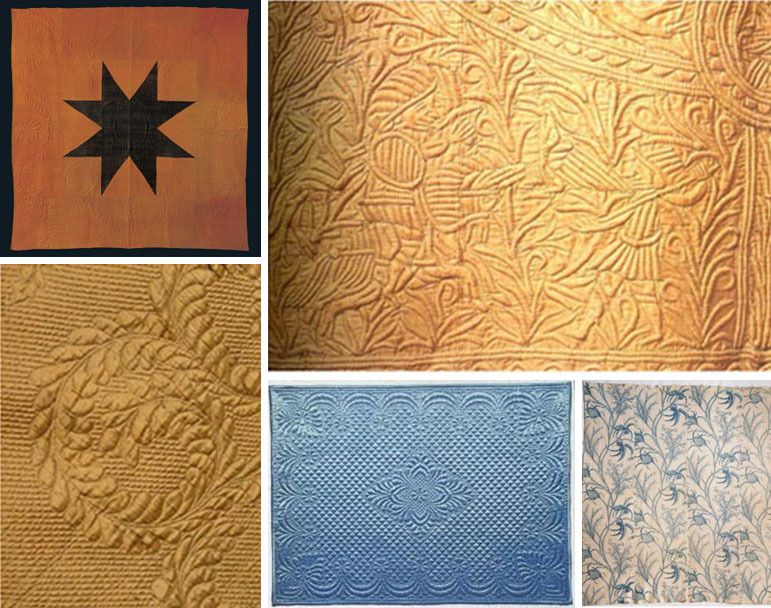 In addition to embroidery, Trapunto or ‘stuffed technique,’ was used to add extra texture and dimension to whole cloth quilts. 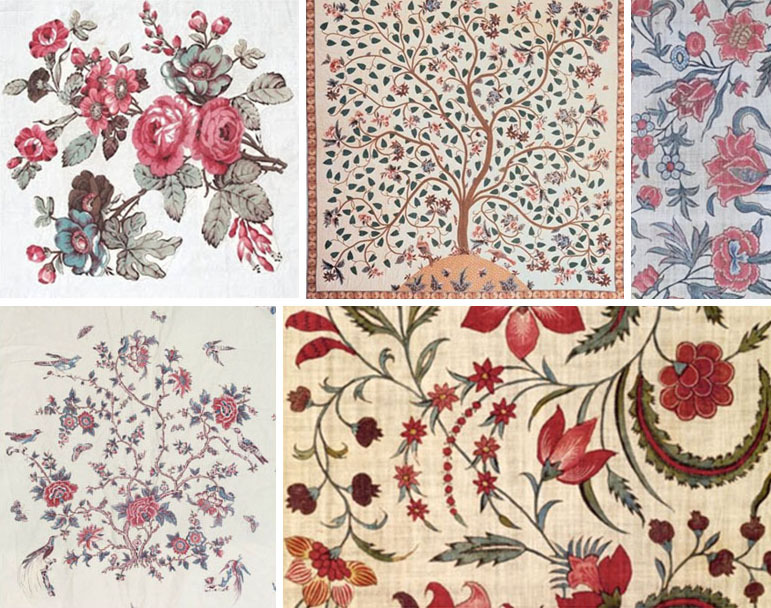 By the beginning of the 18th century, Broderie Perse, French for “Persian Embroidery”, was a popular method of applique created from patterned chintz imported from India. The clearly defined floral motifs were cut out and appliqued onto plain cloth backgrounds, resulting in stunningly beautiful pieces. These quilts were luxurious, expensive and used for display on special occasions. In the 19th century, The Industrial Revolution brought about two key innovations which helped to popularize American quilting. Firstly, mechanised looms emerged, resulting in cheaper American fabrics and yarns. Secondly, the invention of the sewing machine accelerated the process of stitching small pieces of fabric together, making it quicker and easier to piece and produce quilts. om my gosh, I am so loving this series! the historical fabrics are completely stunning. Keep up the good work! Wow, fascinating, and very informative. Both of my grandmothers were quilters, and I have a quilt made by my paternal great-grandmother sometime in the late 1880’s. She made it for my great-grandfather whom was a railroad engineer on the Baltimore & Ohio R.R., so he could stay warm when he had a layover. It hangs prominently on a wall in my family room. That is so cool Chris, thanks for sharing! What a wonderful family heirloom.